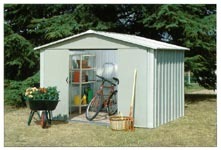 We import Yardmaster rust-proof metal garden sheds. The model M68 sheds cost € 425 ) VAT included. They are delivered as a do-it-yourself kit. It is possible to order different shed-types. We offer special rates when you buy multiple sheds. Designed for self assembly in a light pale green finish. 10 year guarantee against rust penetration. Supplied with anchor kit and 2 transparent roof panels.